PSB Imagine X1T review | What Hi-Fi? Products from Canadian brand PSB, the lesser-known sister of NAD Electronics, don’t often appear on What Hi-Fi?. In fact, the last time we played with a pair of its speakers was about a year ago. It’s a shame, because we’ve rarely been disappointed by them. And we’re not disappointed with the PSB Imagine X1T loudspeakers, either. What we have here are the PSB Imagine X1Ts. 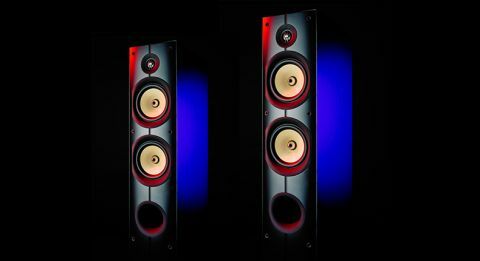 They are the smallest floorstanders in the Imagine range, but appearances can be deceptive. They are short at 87cm and thin at 21cm, but a depth of 40cm means they’re still reasonably chunky. The good news is that they’re fairly flexible about positioning. You can stick them within 30cm of a wall without noticeably affecting the performance. Set-up is simple: plug them in and toe them a little towards the listening position to firm up the stereo image. You can always benefit from some running-in time, but our review sample didn’t exhibit much change even after an extended, solid blasting. Build quality is strong. These speakers feel solid, and they’re surprisingly heavy too. The design will probably split opinions. On one hand they’re minimalist and smart, but we’re not sure how we feel about the creamy, slightly-off yellow of the cones. Prior experience with PSB speakers has led us to expect an energetic, punchy sound. And that’s what we get. The company clearly knows exactly what its customers want, and that’s a fun listen. There’s certainly a lot of energy here. These are agile, caffeinated performers, and they’re eager to charge along to anything you care to throw at them. Play Muse’s Uprising and the pounding call-to-arms intro has a rousing momentum to it. That’s helped no end by the bass, which the X1Ts dole out in spades. It’s a deep, solid sort of bass. The PSBs keep it on a firm leash, but there’s no getting past the fact that there’s an awful lot of it. The balance is definitely tipped towards the low end. Avoid if you’re after a neutral sound. This isn’t it. Not that the treble and midrange feel the need to protest. They’re allowed, where pertinent, to register their say. It’s a fun listen. There’s a real sense of life to the performance. Dynamic shifts are confident and deliberate and there’s a surprising amount of punch, given the size of the speakers. The depth of the cabinet suddenly makes a lot of sense. Reservations? We don’t have many. By this point we’ve accepted they’re not the most neutral performers, prioritising thrills over pure transparency. But we would like a bit more subtlety when it comes to instrumental and vocal textures. The beating of drums is plenty of fun, but it’s occasionally hard to identify the individual components. It doesn’t help that the sound isn’t the clearest we’ve heard. We wouldn’t go so far as to call it cloudy, but neither is it particularly insightful. Overall, we’ve rather enjoyed our time with the PSB Imagine X1Ts. They’re capable, entertaining performers, and they’re aggressively priced. That said, we would like more refinement, as offered by the Q Acoustics Concept 40s, for example. We’d like a bit more precision, too, as shown by the Tannoy Revolution XT6Fs, perhaps. Not a class leader, then, but highly commended.